Submitted by udasu on 2014-02-25 20:19. 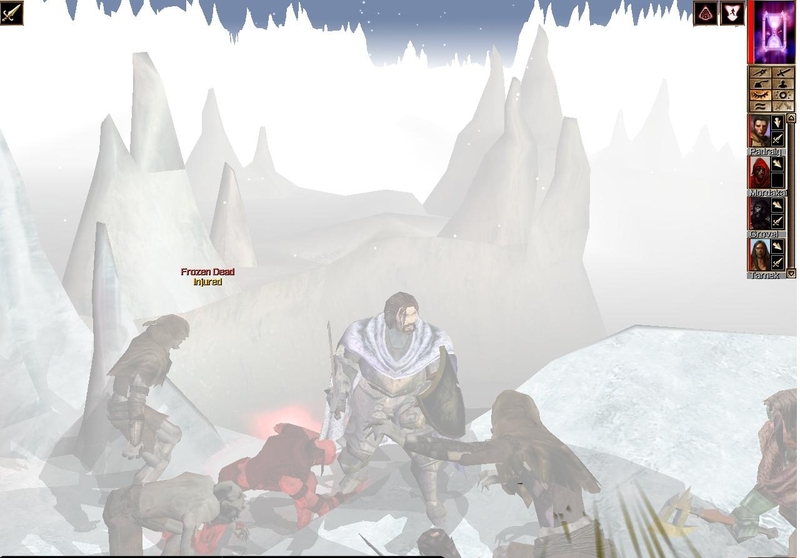 Explore the Frozen North of Faerûn. 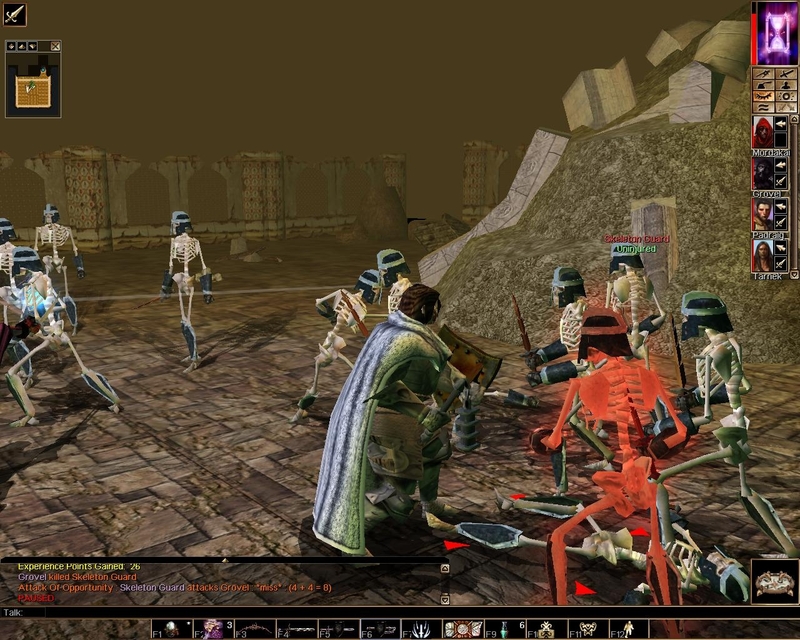 Guard a merchant caravan to the Ten Towns of Icewind Dale. 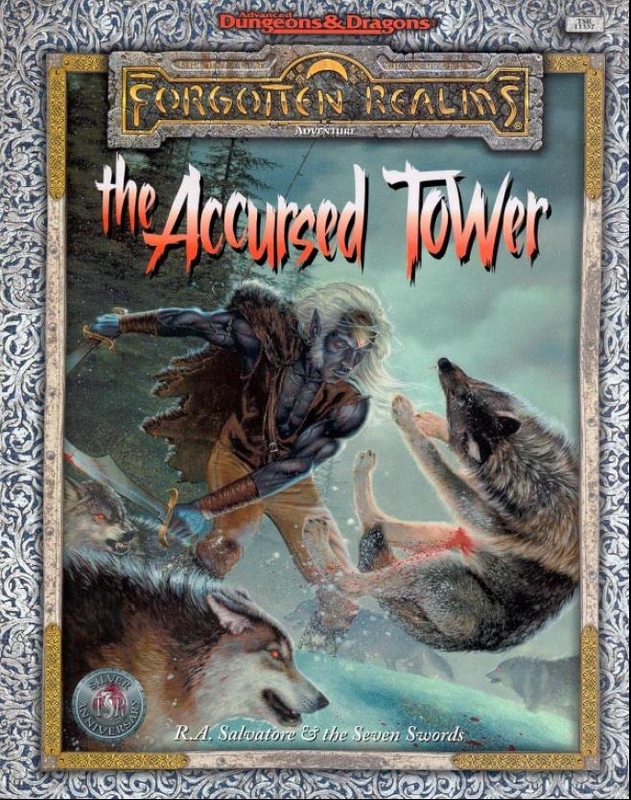 The Accursed Tower starts in the city of Luskan and continues in Icewind Dale around the great lake known as Maer Dualdon. 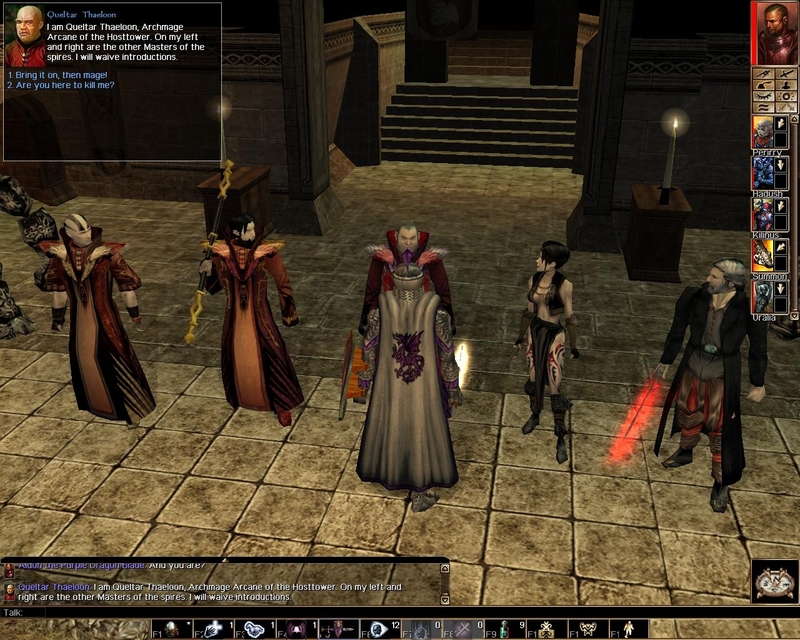 The player characters become the unwitting accomplices to a wizard as he searches for the tower and diary of a long-dead necromancer in Early 1369 DR.
Now updated with the very amazing Project Q Content! I converted the mod as best I could, adding plot build-up when needed and extra adventures when suggested by RA in the mod. A lot of his descriptions are used in the narration, so if you're a fan of RA, you should enjoy the RPG elements. If you're a fan of the IWD setting, books, and games, you should have fun too. I'm in the hidden vale, I dropped below with the phase spider silk. How do I climb the high cliffs in the corner? Everytime I walk near them, it says they're too high to climb. Sorry for not being precise enough. I did not mean how to return back the way I came, I can see the rope just fine. I actually meant the other end of the map: there's a highcliff with a lots blood and impact marks. When you walk over it says it's too high and you're not a mountaineer. Any ideas how? Sorry for the delay. Talk to the Dwarf horse merchant in Luskan, near the docks, for mountaineering gear. There is a playthrough, and I believe I answered via email. ThanksTimG! Thank you both! I will check this out. I gave this module a shot in multi-player, together with a couple of friends. Although it looked like a well polished module, with a plethora of interesting & detailed NPCs (some even recognisable from the original NWN campaign or older D & D game titles) & masterfully created maps, it wasn' t long before various problems came along. Although the adventure is supposed to be playable by 1 - 5 players, by the time we entered part 2 of the module, having left the city of Luskan with the caravan, 2 of the players were trapped in spectator mode with no much of an option, while only one character could take actions. I then tried the game in single player, to see how it would run. This possible bug also showed up in part 2, after having defeated the bridge troll, while searching the bridge area. After a while, the troll, remaining neutral, will attack one of my henchmen. If I attack back almost everyone in the whole module becomes hostile, together with the patron bridge troll, which is also unkillable (this particular one may need fire to die, I have not cleared that up). I have saved & loaded the game multiple times in hope that the issue was temporary & that it' d be fixed, but to no avail. Is there a possible solution to these problems? Spectator? Do you mean you're stuck in a cutscene? The other's a problem with the surrender script and the toolset. A reload usually fixes it. Thanks for the kind words! Yes. Two of us players are stuck in the cutscene, while only one (probably the party leader) is able to act at all. That's weird. The cutscene ends when you finish that default conversation. It does this every time? I re-made the script with ls's generator and it tested okay. Hope it works for you, sorry about the inconvenience. Let me know if anything else comes up. It's a huge one, I may missed a few scripts here and there. We will test it and I will have you know the results.Thank you very much for resolving this.So do we have to re-download THE_ACCURSED_TOWER.RAR & replace all of its contents? Still, the part where you "have to" spare the troll is useless. Let the player kill 'em all and be done with it. I still need to do an evildoer update. I'll add it! I'm adding a new minor add-on after the Accursed Tower in the frozen north. Stay tuned. we tried it with a party of four and three of us got stuck in a cutscene in Northern Means - Hundelstone - Traders District with Dell and Rafferty. Completely broke the game. Nothing we could to to save it. I really wanted to play this module. It seems very well done except the forced conversations and cutscenes do not work out too well for party play. re-downloaded the module file and will give it another go today. I ma pretty sure I already had the latest version but we will see. I will let you know the results. Okay. Re-downloading the module did not fix the problem. So... i opened the mod in the toolkit and went a-hunting for the issue. Always an adventure for me. What I found is the script ent_cnv_hundelst had some anomalies that were different from other, similar cutscene scripts. IT WORKED!!!! Yea! *dances spasmodically and dislocates a shoulder patting himself on the back. I think the issue was the fact that there was no lines to ensure the cutscene only fired one time - for the first PC to enter the trigger - and since all party members are ported by Peddywinkle's previous conversation to the same waypoint inside the trigger, the cutscene fired for every PC in the party. My first attempt to mitigate this was to simply move the trigger further away from the waypoint, but that did not work. The cutscene still fired for every PC that entered the trigger, but the conversation only fired for the first PC. Subsequent investigation discovered that this was caused by a script that destroyed the HundelstoneN object upon completion of the conversation. Ugh. No object = no conversation, or something. Way out of my league. That is when I began hunting down and comparing the scripts for the numerous cutscenes that fired prior to this point in the module and noticed the differences in scripts. So... in true adventurer fashion, I made the change and seemingly succeeded. So... now I only hope this does not cause other problems. Peddywinkle still seems to do what he is supposed to do and nothing seems whacked, yet. Hopefully future cutscenes dont have the same issue. I guess if they do at least now I know how to (maybe) fix them. Better if the author undertook this project as s/he ostensibly has some clue where all the cutscenes are and I do not! Yet. Thanks for fixing the script! I'll playtest, update for sure. Feel free to email me more feedback at udasu@yahoo, as I don't get always get to the vault regularly. Bhaelrot - I went through, and I found about 20-30 similar scripts, and updated them all with the correct update. I'll playtest too when I can, but this ver should flow better. Thanks again for finding that script issue. I suppose I wrote this one a long time ago, and I was a novice at scripting at the time. Enjoy, and please feel free to send me more feedback. Went through again, and updated another 20 or so enter 1st time scripts. Fixed all the things I broke updating the enter scripts. Played and playtested through to the end. Will update this old one again one day. Just finished a solo play through. fantastic as always. The only script trouble I had was at the demon vision when going into the hole at the tower. It took about 10 tries and only worked when I had the henchman with me. It definitely was a scrpit not firing right because it started into a conversation pause and then just hung up. Still, what a fantastic ride. Thanks bud. I'll do a once-again-though, fix it with the next upload. Glad you enjoy it so much! Is this the module that hit the hall of fame on the old vault? Yes, this module had Hall of Fame status on the Old Vault. That's why it has the tags and label for it. No, I just wanted to see if I played it already, which I have if it hit Hall of Fame on old vault. If you can't remember actually playing it, then what are you basing your score on? It's probably worth the score, but I think you can see the point I'm trying to make. Played it a third time, still love it. Fixed a few more broken scripts (Kinnuki spawning, evil dialogue threads, dialogue massage, knucklehead skulls retrieval, tower entrance, etc. ).May get a new QA report soon. When I do, I'll update. Played this lovely module with bard/RDD/AA on good path. I can clearly see how this oldie got HoF at old vault it was one hell of a ride. Reminder to myself: class quests, both good and evil paths. Our mainest man, Werelynx, has been sending me great QA, tweaks. I should be uploading the latest and greatest version soon, with an updated walkthrough too. The Accursed module is updated! Updated mod, 2 haks, and walkthrough. always nice to see updates. Just don't break the multiplayer side of things. I'm on summer workload now but this is number 1 on my fall play list. Auursed Tower and Eye of the Beholder by Dark are the best two modules I have played. Just enter scripts, so we should be fine for MP. Give and tp scripts are mp friendly too. Had to add those BG gnome heads - and the bloodsailer/noble overrides from Shemsu-Heru! Also moved some of the more powerful magic items down in scale or towards the end, for balance. 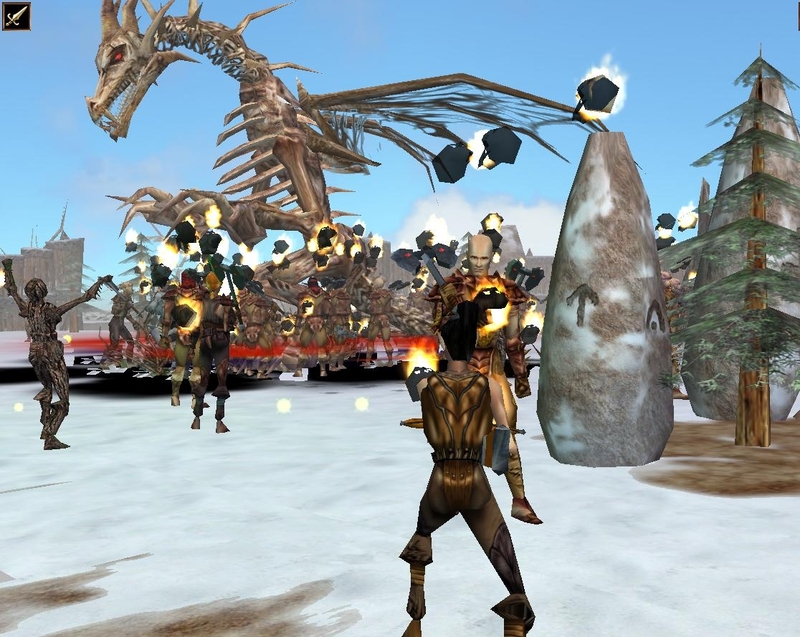 Udasu, I am currently playing this mod. So far a very nice module (kudos for custom music and possibility to level up henchmen in many classes), although I wonder why you did not use (at least it's my experience so far) Winter tilesets from Shadow Tower Ordeal? They would probably fit in to your story. Anyway, the on-the-road feeling is really encouraging so far. One inconvenience though: illusionary multiple choices in dialogue are not my favourite way of leading conversation if they do not change the following sentence by our interlocutor. I have a couple of questions: A/- can you return to the visited places without using Stone of Recall (e.g. in order to explore a set of locations you did not explore previously) or maybe once the caravan sets forth, there i no coming back?). B/ you wrote elsewhere that you recently uploaded a new version of TAT. What has changed? Should I start playing again (I have reached raiders' base so far). C/what is the expected level of my character by the end of the gameplay? Also, some bugs: 1/ I found a bug related to assassin Carver in the cave with Old Hermit. He showed up twice! First, on my very first visit to the cave he mutilated my team in seconds (killng him with 2level group is almost impossible!) and then after I returned with the water. I am almost sure it makes sense for him to emerge only after you return with water, so I am telling you this. 2/ my level 5 cleric casts only Bless in battle and you cannot make her cast other spells than Aid and Bless via dialogue options. Regarding the Wildlands, I made this a while ago, before it was created I believe. I suppose it might fit - a lot of haks already. I suppose I can edit the dialog some more. I think it ends with the pc at 10th-12th level. As far as going back, yes, talk to Sir Stuck in the Temple of Helm. He can send you where you want to go. Not much has changed, mostly new npc's, some more cosmetic stuff (models, etc.). I fixed a few enter scripts, and also moved some magic items around for game balance. Carver bug - Not sure why that happened, should only fire once. I have modified the spawn script so it should only fire once, in case you escape the convo after first spawn. Feel free to start a new game if you like, it might be more stable. Also feel free to send bugs, ideas directly to my email - udasu@yahoo.com. Use this version (7.2) - all of the enter scripts should be working now. 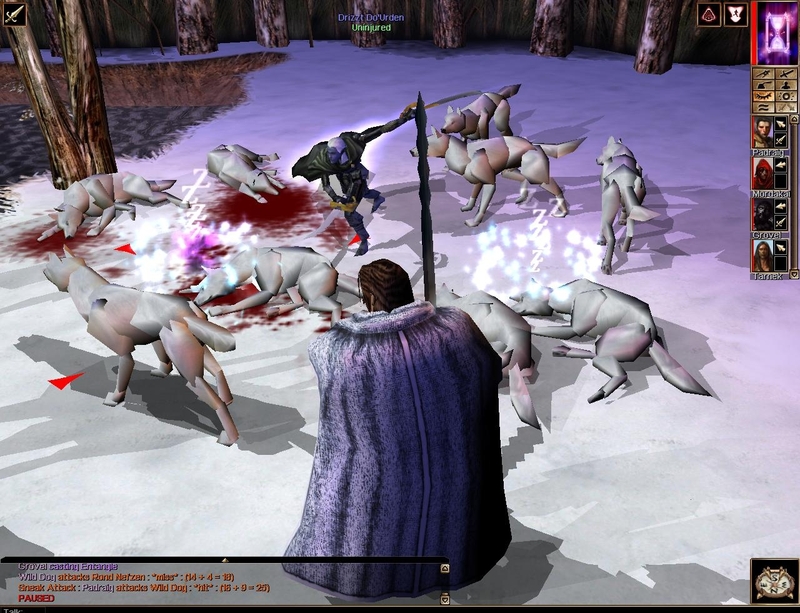 1/ There seem to be a problem with Guthewolf in Targos. On first meeting him, he offers something for me in exchange for collection of items. My all henchmen speak of their own quest related items as important here (e.g. Halgren - ring, the bard- pipes, Padraig- gloves). The problem is out of these items I only have a ring and the pipe, thus lacking Alia's and Padraigls relevant items). This is diappointing especially that I carefully walked throughout the areas doing all quests. Might this be that I triggered some scripts when leaving my henchmen for a while and behind to walk solo for a while? 2/ After confronting Peddywinkle about his identity, he calls his workers to distract me, but does not disappear from the room. Instead he stays there, capable of repeating the script of greeting me anew. 1) from what I know, you are supposed to keep your henchmen - they have lines in conversations for example. I managed to get all items from hench quests so I know it is doable - but I never let the henchies go. #1, I moved the henchmen/magic items interaction until *after* Gunthewulf sees you have all of the required items. The walkthough will tell you where the items are, or feel free to PM me, here or on email. #2, It seems as though the script to change the faction of Peddy and Raff to Hostile wasn't complete (but it is now). In my next upload, I'll add a link for the winter wildlands too. Based on your recommendation, I've added it for a NEW Lonelywood and Lone Tree. Thanks for the ongoing great feedback, you're making the adventure even better! Hey Udasu, I have just finished the module. It is a very cool story driven module I will consider replaying in the future! These winter tiles you spoke of applied to Lonelywood will look insane! Should you create such feasts, you may oncebeat Aielund Saga as No1 module on the Vault :) I was to grant 8/10 but I grant 9/10 as your works deserve it. - Selection of decent writer as a basis of your story and introductory "excerpts from a book" that trigger in some areas. - Immersion and lore - the way you relate to the D&D universe and its broader history. - custom music and characters actually uttering sounds and speaking some sentences. - the way you build areas and use of tilesets -- there are no empty areas, some areas are tiny, if it is optimal for them to be like this. - problems with triggering of scripts (as addressed above), thanks for correcting them. - Not much choice in places. I understand it is partiallly due to the fact you make modules based on literature, where story is linear. I can live with this. But my comment here should relate mostly to frequent meanigless dialogue options that distort the logics. For example: NPC says something and you have options A,B,C, all of which are followed by sentence D, which is logically consitent to thee fullest only with C. (e. A/Did they do this? B/Who were they? C/Where did they go? -- answer: No, they didn't do this or that). Don't you think it would be better to get rid of A,B,C and place [continute] button in their stead? - Fights were a bit too easy by the end of the game (but it might be my fault as I created extremely powerful Cleric (8)/Rogue (2)/ Fighter (1) with Air Domain and Silent Spell, which in principle means I had a very good fighter with electric equivalent of mage's fireball to be cast 8 times per day. - exits from areas could be marked on the map. In some places had to mark them myself in order not to get lost. Tell me, did Elminster really say there will be another story in Ten Towns one day? :) Should I proceed to Lankhmar Nights?